Migrating birds are in crisis in the Yellow Sea. But a Chinese bird hunter and a small group of Shanghai birdwatchers are working to save them and their mudflat habitats. Ann Jones flies north to Shanghai as shorebirds from as far away as Australia, Indonesia, Thailand, Myanmar and Bangladesh arrive on the coast of the Yellow Sea. Here she meets a traditional whistling bird hunter who used to catch shorebirds for the pot but now does it for science. Bird mimic Mr Jin Weiguo demonstrates his centuries-old technique of bird trapping - luring them into nets by copying the different calls of the many different species. Scientists can then attach ID rings and GPS transmitters to follow their migration and estimate their declining numbers. 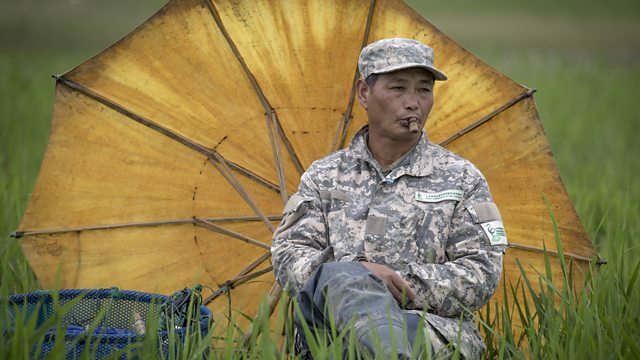 In ten years as a conservation trapper, Mr Jin has caught more than 10,000 birds. In Jiangsu province to the north of Shanghai, Ann also spots the world’s smallest and most endangered shorebird – the remarkable spoon-billed sandpiper. This species is regarded as the Panda of migratory shorebirds – a charismatic flagship species for the protection of the rapidly disappearing mudflats on which all the migratory shorebirds and local fisher folk depend. Ann meets the Shanghai birders who set up an NGO to save the most important surviving locations for this bird’s crucial spring and autumn breaks in the Yellow Sea. One 7km stretch of coast, known as Tiaozini, hosts at least 50% of the world’s spoon-billed sandpiper population, which after a precipitous decline now numbers about 200 breeding pairs. Tiaozini is now recognised worldwide as a critical place for the species’ survival. The provincial government has advanced plans to convert Tiaozini into dry land within five years. Additional recordings in this programme were provided by the Macaulay Library of Natural Sounds at the Cornell Lab of Ornithology. The series is a co-production from the BBC World Service and Australian ABC Radio National. Additional recordings were provided by the Macaulay Library of Natural Sounds at the Cornell Lab of Ornithology.